Jen Stout explores the forgotten work of artist Norman Wilkinson, who created ‘Dazzle ships’ in the First World War to confuse German U-Boats by disguising a ship’s size, distance and direction. This anti-camouflage device is re-created in Leith Docks on the MV Fingal (pictured). A wee trick to amuse you, if you’re one of those people who spend too much time exploring unknown streets and intriguing places on Google’s immersive street view: Shuffle east along Leith’s Ocean Drive, alongside Albert Docks, and as the image date switches from 2015 to 2016, the handsome black-and-red livery of the old ship docked there suddenly becomes a uniform, battleship grey. But go there yourself today – for the next few weeks, at least – and you’ll find another transformation – every inch of the 239-foot ship is covered in a bright geometric print, pinks blues and blacks standing out starkly in the November driech. 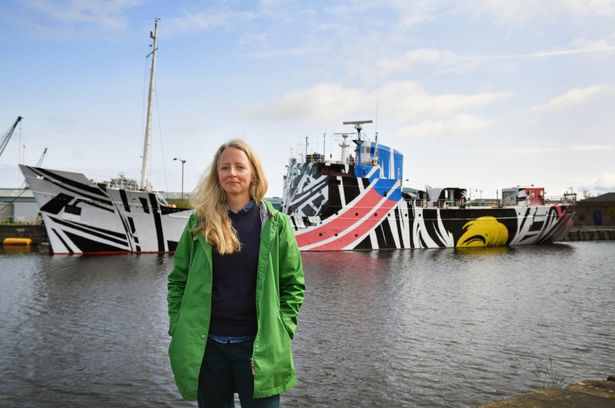 This is the MV Fingal, and the story behind her current guise as a work of public art is just as fascinating as her former life supplying far-flung lighthouses around Scotland’s coast. Whether the next incarnation – luxury “boatique” hotel (no, really) is quite as interesting, remains to be seen. But to begin in the present: The Fingal is temporarily named Every Woman, to go with the – also temporary – artwork. 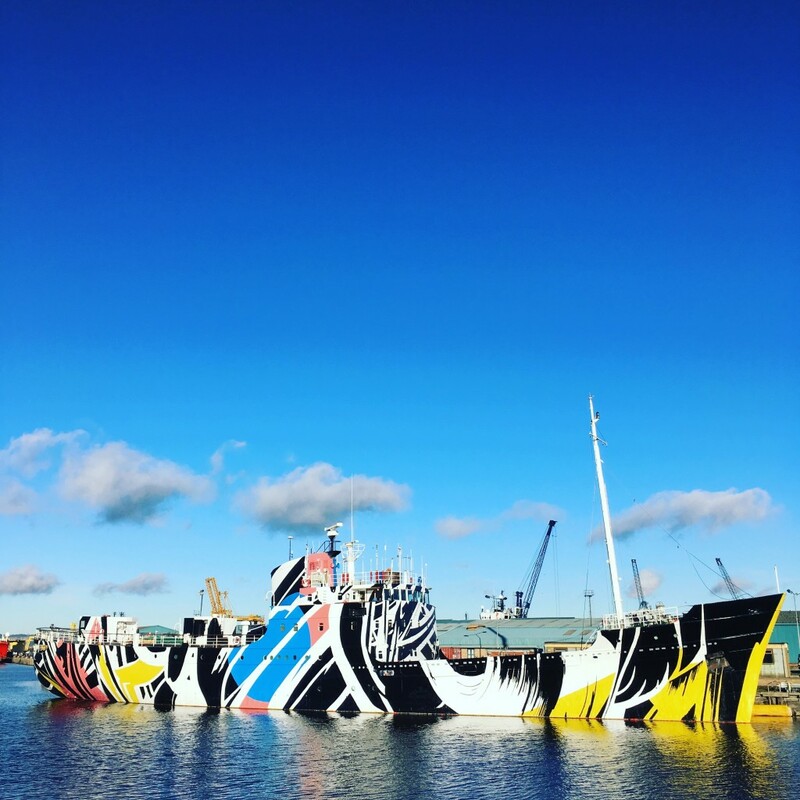 It’s the work of Glasgow-based, Turner-nominated artist Ciara Phillips, and is one of four ‘dazzle ships’ commissioned to mark the centenary of the first world war; part of the 14-18 NOW programme. Dazzle camouflage was an extraordinary phenomenon which saw over 2,000 vessels painted in complicated and outlandishly bold designs. It was an optical illusion on a massive scale: as boats could not be hidden from submarines, the dazzle designs, dreamt up by artist Norman Wilkinson, were meant to confuse the enemy by disguising a ship’s size, distance and direction. Whether or not it worked particularly well is still debated. It was, some say, largely a morale-boosting exercise during Germany’s brutally effective U-boat campaign. Laid into the ship’s design, which Phillips adapted from a previous screen print she’d made, is a glow-in-the-dark Morse Code message from which the piece takes its name. E V E R Y W O M A N A S I G N A L T O W E R flashes in reflective paint at night, acting both as a reminder of women’s wartime role, and as a broad statement of female agency and the power of communication. The phrase itself comes from the infamous Irish captain James ‘Jack’ Spratt, who developed an early system of signalling. It would be possible, Spratt argued in his 1808 treatise, to send a message across a distance of miles using only the body and a handkerchief. Later came the flags and signals of semaphore; although still used in emergencies, improving technology and communications spelled its end, just as they did for Dazzle paint, which was rarely used after WWI. Laid into the ship’s design, which Phillips adapted from a previous screen print she’d made, is a glow-in-the-dark Morse Code message from which the piece takes its name. E V E R Y W O M A N A S I G N A L T O W E R flashes in reflective paint at night, acting both as a reminder of women’s wartime role, and as a broad statement of female agency and the power of communication. The ‘signal tower’ phrase also links the work to the Fingal’s romantic but very functional past as a lighthouse supply vessel. For those of us from the fringes of Scotland, the Northern Lighthouse Board’s vessels and helicopters were a familiar sight growing up (as were NLB boilersuits, spare paint, and whatever else made its way into the crofts). The Leith-registered Fingal was deeply rooted in Scotland’s social history. She was the last vessel to be built at Scotstoun’s Blythswood Shipping Company, in 1963. For 30 years the Fingal was based at Oban, ferrying keepers and supplies to and from the string of lighthouses along the West Coast, followed by six years working out of Stromness. Henderson, who joined the NLB in 1974 and left when automation struck in the late 1980s, worries that the story of the manned lights, with their unique way of life and the many many families whose lives were shaped by them, is being lost. Families frequently had to up sticks and move to another posting, and this would be done on the boats too. Henderson himself moved from the volcanic landmark of Ailsa Craig in the Firth of Clyde, all the way to Fair Isle in the far north (where, incidentally, the last manned light was automated in 1998). “All your goods had to be boxed, wrapped, roped for slinging off piers, on to tenders and slung again onto the Fingal and down into the hold”, he recalls. The flit took place on the Pole Star, which was also sold on in the 1990s as the NLB updated its fleet. It is hard not feel sad about the fate of some of these boats; aside from the wealth of social history they carry, they were elegant and well-made – and in Scottish yards, too (a tradition now gone: the latest NLB vessel Pharos (X) was built in Gdansk nine years ago). Perhaps it’s just the boat-nostalgia common to islanders, but the fact that the Pole Star (III), a beautiful vessel similar in design to the Fingal, was last heard of stranded, damaged, on a slipway in Trinidad & Tobago, seems fairly poignant. To the future, though: Just like the old Pharos which now cruises the Caribbean, the Fingal is destined to become a high-end floating hotel. Sold in 2000, she spent a few years in Cornwall under the frankly embarrassing title Windsor Castle (a clanger on so many levels), but is now owned by the Royal Yacht Britannia Trust, which mercifully reversed the name change. Because this is Edinburgh and any structure whatsoever apparently must become a hotel, that is what’s planned for the Fingal, which will eventually become the Yacht’s ‘boatique’ neighbour in Leith. At least she’ll be kept in good nick, you have to think – but imagine what other roles could have been possible. Down south, you can actually join the working vessel Patricia, servicing lights and buoys – a cruise for lighthouse enthusiasts. Will the rich history of the Fingal be communicated to its new guests? It’s hard to tell – the Trust told us that “the internal conversion designs embrace the ship’s historical role”, with design features “inspired by original fittings”. Cabins will apparently be named after lighthouses. Whatever the future holds, the Fingal has certainly had an impact in its dazzle guise. Ciara Phillips explains that the education programme run over the summer has been a great success, with hundreds of local children learning about Dazzle and making their own patterns – one primary school even making its own dazzled canoe. The enthusiasm of the kids is “really heartwarming”, Phillips says. Though the bold paintwork will doubtless divide some opinion, it’s impressed others so much that a Facebook group has been set up demanding the Every Woman art is kept for posterity. Art teacher Laurie Anne Carr is behind the campaign and says she was blown away by Phillip’s project. “It’s a piece of contemporary art that can be accessed by so many people”, she enthuses, “a national asset, that would surely boost tourism. Fair enough, turn it into a hotel – but keep what’s already there!”. Royal Yacht Britannia Trust, when contacted, was unequivocal: the dazzle will be painted over with a livery “appropriate for the age and character of the vessel”. But there’s still a couple of months left to see Phillips’ artwork, before the Every Woman becomes the Fingal once again. At least the bleak winter darkness we’re now in makes it easy to spot the clever morse code message – and the Edinburgh Art Festival, in which the Every Woman played a central role this year, is apparently planning to illuminate the ship soon. With no manned lighthouses left, and their histories fast slipping into myth and memory, it is a comfort that this ship, which played such a big role in the Scottish lighthouse story, will not end up abandoned on some distant slipway. Instead, after this stint in the limelight in full Dazzle glory, the Fingal will live on back at Leith, becoming part of the fabric of the port. Sort of says it all as we dazzle and fool ourselves with kaleidoscopic political statements.